Happy National Barbecue Day! Now that it’s barbecue season, people are always looking for sides to serve when they host, or to take along when they go elsewhere. Here are two that I’ve been making for years. 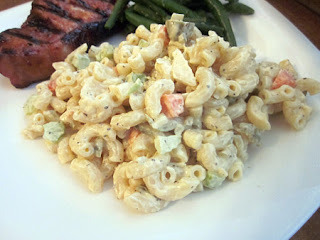 Macaroni salad is my absolute favorite! As usual, I use Dreamfield pasta to minimize the guilt. 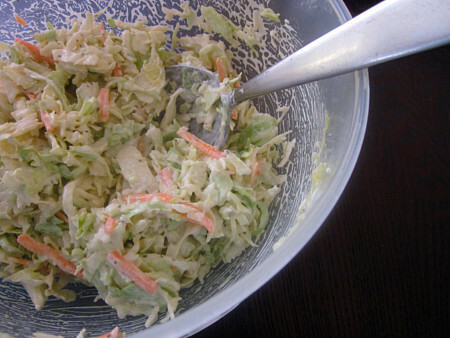 As for the cole slaw recipe, I played around with Bobby Flay’s recipe for a while to lighten it up, and came up with a version that tastes great and is more figure friendly. They’re both easy to prepare and transport, and feed a good sized crowd (though you should double the cole slaw recipe in that case) These are perfect accompaniments for burgers, hot dogs, chicken, pork…you name it. Make them your go-to sides for the summer! Mix macaroni, celery, onions, bell pepper and green olives together in a large bowl. In a separate bowl mix together the mayonnaise, mustard, vinegar, relish, sugar, salt, pepper and celery seed, stirring well. Stir dressing into the macaroni mixture. Serve chilled. Put cole slaw mix in a bowl. Whisk together remaining ingredients and add to the cole slaw mix. Combine and add more salt, pepper and/or sugar, if desired. 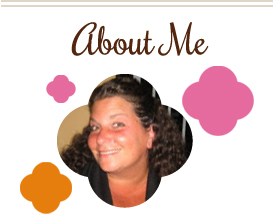 This entry was posted in Bobby Flay, make ahead, pasta, salad, side dishes. Bookmark the permalink. You’re right, I’m always bringing salads to BBQs in the summer, so I’m always looking for new great ones. These both look delicious. I love a good macaroni salad!